Hard to believe, but it's been twenty years since Stone declared that we weren't worthy to drink their beer. This turned out to be a successful reverse psychology gambit, as they've enjoyed quite a bit of popularity over the years. For their 20th Anniversary, they embarked upon a series of Anniversary Encore beers. 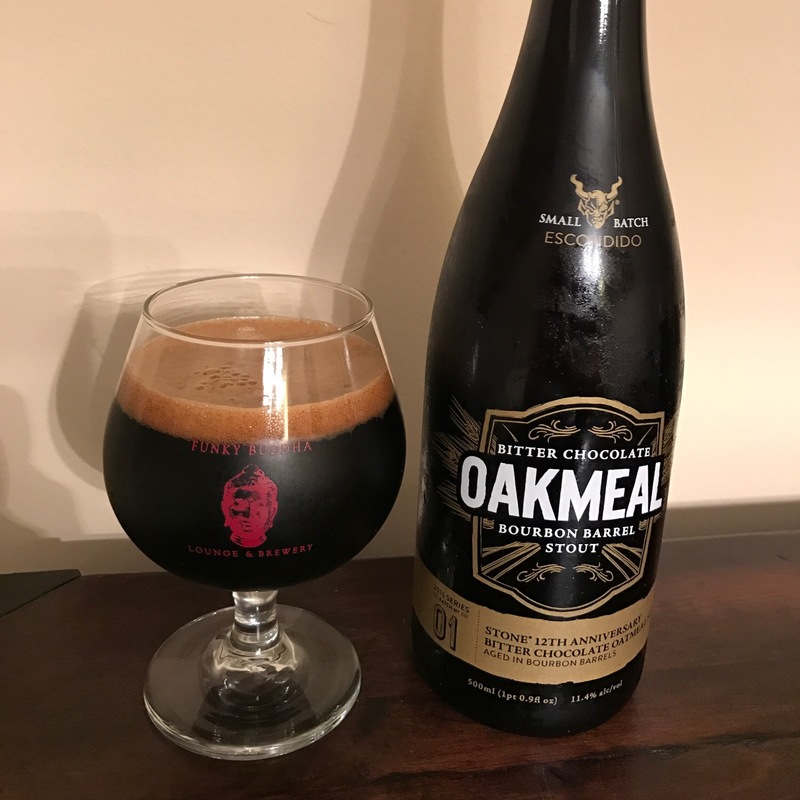 Back in January, they released a rebrew of their 12th Anniversary Bitter Chocolate Oatmeal Stout, but they also reserved some for the Bourbon Barrel treatment, released in August and dubbed Oakmeal, which is what I have here. Beer Nerd Details: 11.4% ABV bottled (500 ml caged and corked). Drank out of a snifter on 10/8/16. Brewed: December 5, 2015. Bottled: July, 2016. Stone seems to have focused this year's barrel aging efforts on creating variants of their Xocoveza beer, which I'd gladly try... but I'm still jonesing for well-aged Fyodor's again. Fingers crossed. This page contains a single entry by Mark published on October 11, 2016 10:47 PM. Zwanze Day 2016 was the previous entry in this blog. Burlington Peach of Mind is the next entry in this blog.